Integrators may look at products from Martin for a full line of tour quality LED and traditional moving lights, as well as fully featured entertainment and architectural product lines. Pictured is the Biltmore Baptist Church in North Carolina. The year 2015 is finally upon us and yet many of house of worship facilities seem to forget that “L” part of the holy trifecta. And by trifecta, I’m of course referring to AV L systems. You see, the righteous order of importance in the house of worship world when it comes to technology usually goes a little something like this. Audio always gets first crack because you definitely need a sound reinforcement system to hear the spoken word, otherwise, there isn’t much point now is there. Then come the big boys of video with their big toys, who get to spend all kinds of budget dollars to ensure that everything is recorded in glorious high definition, not to mention if they are utilizing something a little more adventurous like IMAG or, dare I say, broadcast. Then, if there is any budget room left over, someone usually mentions lighting, and the general contractor offers to save some green by providing some additional segregated down lights near front of house that are at the minimum, hopefully, on a separate breaker; if the client is lucky, it’ll be on a separate switch—maybe even a dimmer (fingers crossed). To most traditional integrators, this may sound like a familiar narrative that they don’t see any issue with, or at most, they may consider adding a couple of Fresnels to bring some light front of house. But to the enterprising, forward-thinking integrator, this just sounds like an excellent opportunity. 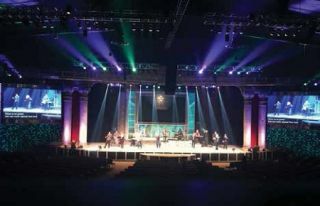 Stage lighting in the house of worship market is no small field either; this market consists of various segments that can be utilized individually or combined within multi-purpose applications. Almost all facilities can make use of traditional stage lighting systems to allow for proper lighting of the front of house/stage area. Many facilities are now making use of lighting systems primarily used to complement the video department, providing lighting system designs that are dedicated to lighting the talent for video production. Many cutting edge facilities are also now using atmospheric lighting systems that can and do rival those of the most complex nightclub or concert venues. While many facilities will focus on one of these types of lighting systems, many are finding the perfect blend of these systems that best fits their needs. When integrators are looking at venturing into the house of worship lighting scene, it may be very encouraging to note that many of these facilities don’t make use of any substantial stage lighting systems at all, leading to many opportunities for you—you enterprising integrator you! One of the key ways to expand your business into the house of worship stage lighting market is to understand how just about every single lighting system can be evaluated and improved easily. In addition, and most importantly, we as integrators must do our best to convey to our house of worship clients that they need to be making informed decisions about their facility that include some level of stage lighting. This is especially true when we are already working with a HOW client on another project. For example, working on implementing a video system for IMAG within a facility is the perfect time to express how important lighting for video is and how the client’s IMAG system should include a lighting component to properly achieve a true IMAG system. We can also use an existing system as an opportunity to upgrade our clients. I recently met with a client that had an incredibly basic lighting system focused exclusively on video that required some additional fixtures to upgrade the IMAG video. We are now looking at augmenting their existing system with complete LED atmospheric lighting, allowing the client to create much more dynamic and creative video productions. As you delve into this new world of stage lighting opportunities, you have to be aware of the various price points surrounding these products and how they can affect venue expectations. Just like any other market, there is a large gamut of budget and facility sizes that can and should dictate the products you look at for each specific project. Many smaller facilities can be lit quite well utilizing entry-level products from manufactures like American DJ and Chauvet, which both make some great products that are easy on the budget. I personally utilize many of these products for clients that are making their first foray into stage lighting. As the individual venue’s needs increase, products from companies like Elevation and Robe are very useful in creating great lighting scenes. Integrators may even look at the products from Martin or Clay Paky for a full line of tour quality LED and traditional moving lights, as well as fully featured entertainment and architectural product lines. We have used many Martin products in our system designs and have seen great results from working with them in a house of worship environment. Many of these manufactures will offer products that suit your clients needs, and you will have the opportunity to find our what products and manufactures suit you and your clients best. Stage lighting can and should provide you with many new avenues for new business in this New Year if you are adventurous enough to pursue the opportunities. Matt D. Scott is president of OMEGA Audio Video in London, Ontario, Canada. Find him on twitter @mattdscott or @omegaaudiovideo.